St. Martin's Press, 9781250074379, 304pp. Jane Kramer started cooking when she started writing. Her first dish, a tinned-tuna curry, was assembled on a tiny stove in her graduate student apartment while she pondered her first writing assignment. From there, whether her travels took her to a tent settlement in the Sahara for an afternoon interview with an old Berber woman toiling over goat stew, or to the great London restaurateur and author Yotam Ottolenghi's Notting Hill apartment, where they assembled a buttered phylo-and-cheese tower called a mutabbaq, Jane always returned from the field with a new recipe, and usually, a friend. For the first time, Jane's beloved food pieces from The New Yorker, where she has been a staff writer since 1964, are arranged in one place--a collection of definitive chef profiles, personal essays, and gastronomic history that is at once deeply personal and humane. 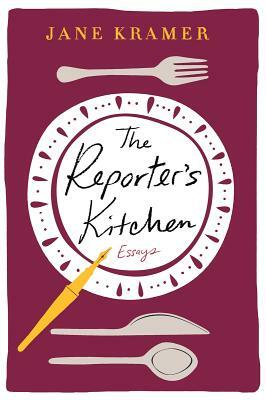 The Reporter's Kitchen follows Jane everywhere, and throughout her career--from her summer writing retreat in Umbria, where Jane and her anthropologist husband host memorable expat Thanksgivings--in July--to the Nordic coast, where Jane and acclaimed Danish chef Rene Redzepi, of Noma, forage for edible sea-grass. The Reporter’s Kitchen is an important record of culture distilled through food around the world. It's welcoming and inevitably surprising. JANE KRAMER is the longtime European correspondent of The New Yorker. She has also written for The New York Review of Books, The New York Times Magazine, The New York Times Book Review, and Vogue. She is the author of several books, including The Reporter's Kitchen, and has been the recipient of a National Book Award, a National Magazine Award, a Front Page Award, and an Emmy Award. In 2006, she was made a Chevalier de la Legions d’Honneur in France and, in 2016, she was elected to the American Academy of Arts and Letters. She divides her time between Europe and New York.